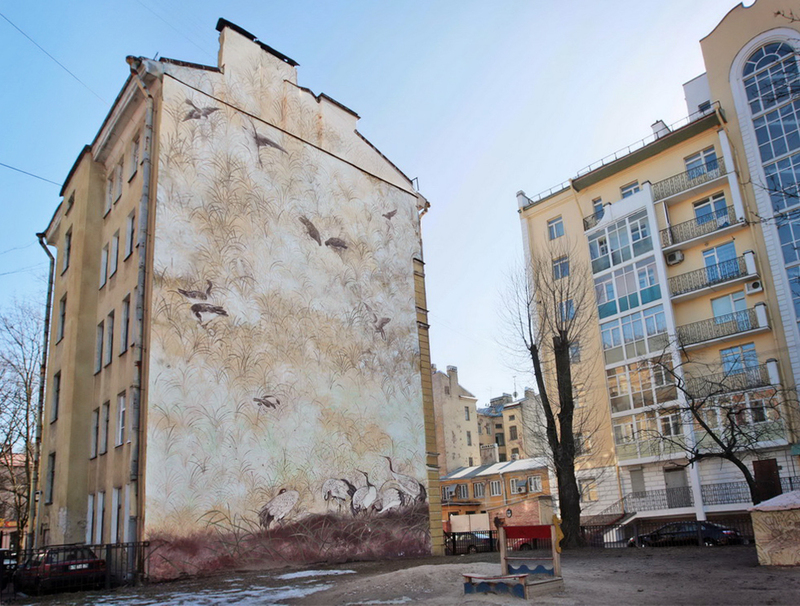 Back in 2007, in St. Petersburg, when I was still a student of an art academy, me and my friend Pavel Shugurov were dreaming about being muralists, not just on paper at school, but to actually make it our careers. We created many interior decorations and indoor murals, but since the end of the Soviet Union Public Art in the form of outdoor wall murals completely disappeared in Russia. 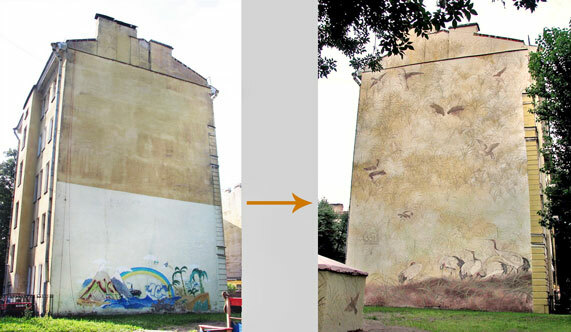 We tried to work with local governments to get a permit for the mural (the appearance of all buildings are controlled by the government in Russia), but nobody was ready to risk their status to allow us to paint a mural on the façade, especially downtown. So to move from a dead point we created a plan: we found a wall, it was facing a kindergarten playground that was perfect. 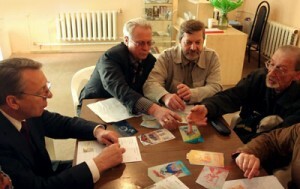 Artists creating design ideas for the wall mural: Yulia Avgustinovich, Yulia Gorshkova, Alexey Bogatyrev & Pavel Pavlenskiy. Then we created a competition among artists for the best mural design and invited city government, Dean of the Art Academy to be jurors. So, after they chose the winner there was no way for them to say no to the mural itself. 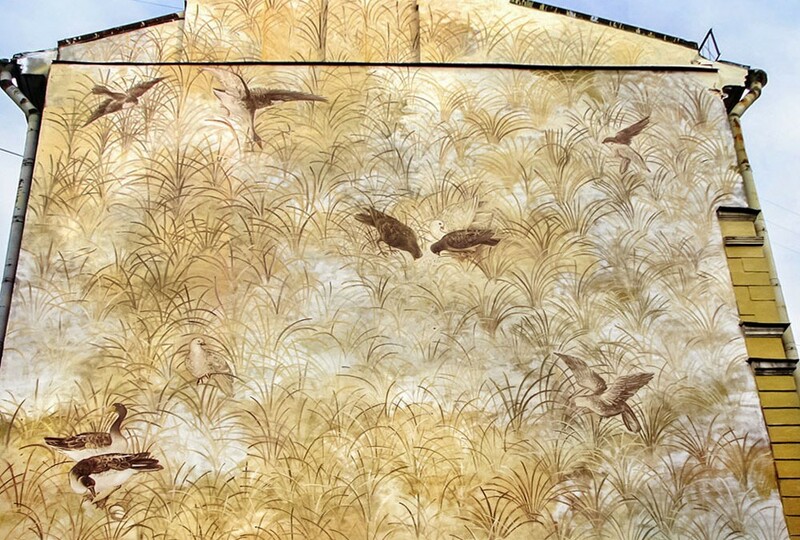 The historical surrounding of this place dictated the quiet colors of the mural design that was chosen. “Birds in a Meadow”– the winner design idea by Kuzminov Stepan. It took us a year to turn into reality our plan and organize everything – but in the end, we received a final letter of permission. We paid for all expenses from our own pockets, it was very important to realize the mural and lack of sponsors didn’t stop us. We completed courses on industrial alpinism and got legal certificates to work on heights. 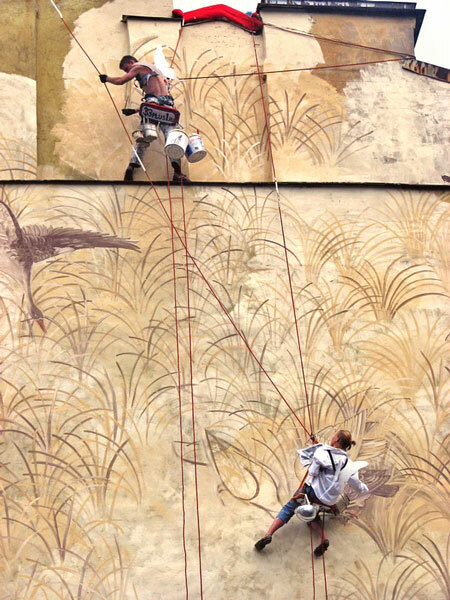 While working on the mural a lot of press and mass media were invited to popularize the mural painting. Eventually, after this wall mural was finished, government clerks were very impressed with the amount of positive attention from the public we received and next mural commissions started coming in! Depending on the types of murals you do, you could start with as little as $100 for tools and materials. Typically, customers pay you half upfront for a job, so you can use that advance to buy your paint.